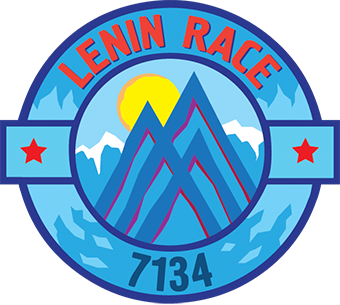 Lenin Peak Sky Marathon aka. Skymarathon® will be held from August 23 till August 25, 2018. The race starts from from BaseCamp=Camp 1 (4400 m) through Razdelnaya Peak (6100 m) and finish at the top of Lenin Peak (7134 m). Everybody who has climbing experience is allowed to participate in the Skymarathon®. The run time is clocked from the time of start to the checkpoint established on the summit. The run is successfully finished, when the participants independently reach the alignment and descended to the launch site not later than at 15:00 the following day. The the participant can not descend without help or returns to the base camp after 15:00 h, the participant’s result is canceled. The route check marks will be specified on the spot, if the control time is exceeded, the competitor will be eliminated and recommended to descend. It is forbidden to use any transport, skis, or use of outside help.